What is the best wine cabinet? Both long and short term wine storage.. Being in the wine trade and supplying people who value their wine collections, as well as restaurant managers / sommeliers who are serving high quality wines, we get asked this highly debateable question a lot, “What is the best wine cabinet?” Truthfully, it all comes down to personal preference. It depends on where you want to store and place your wine cabinet within your home or restaurant, whether you’re looking to use the cabinet for short or long term wine storage. You also have to think about the quantity of bottles within your collection that you’re looking to store within the cabinet. All of these aspects need to be taken into consideration before choosing the right wine cabinet for you. If you’re unsure or need some helpful advice, be sure to contact Wineware and we’ll be happy to help! 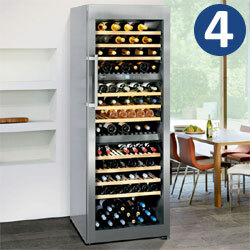 Below we’ve listed what we believe to be Liebherr’s top wine cabinets available in the UK! Temperature: 1 temperature zone – Remains constant from top to bottom. Can be set from +5°C to +20°C. Value for money? Yes! This cabinet is by far the most popular from the Liebherr range. 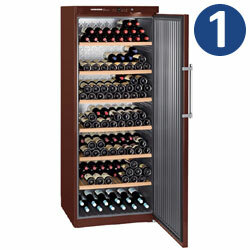 You’re able to store over 300 bottles of wine at one constant temperature. It’s great value for you money! Is this wine cabinet for me? If you’re looking for a large storage capacity with a single temperature zone, this is the cabinet for you. It features a solid door rather than a glass door, so it will sit well next to your standard kitchen fridge. Temperature: 2 temperature zones – Both can be set to a range of +5°C to +20°C. Value for money? This Liebherr wine cabinet is one of the more expensive models. However, it does have a certain ‘wow factor’ about it. This modern looking cabinet with a stainless steel finish and a glass door not only stores your wine, it shows off your collection spectacularly. Is this wine cabinet for me? If you’re looking to store over 200 bottles in a fantastic, modern looking wine cabinet with 2 completely different temperature zones, then this is the cabinet for you. Store your reds in one part and your whites in the other, all at the perfect temperature. 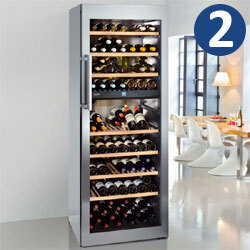 Alternatively, you can store your long term wines in one area and your short term wines in the other. Temperature: 1 temperature zone – Differs from top to bottom. Ranges from +5°C to +18°C. Value for money? 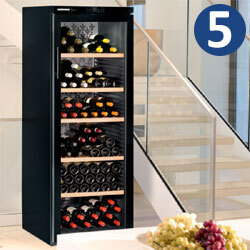 This Liebherr wine cabinet is extremely good value for money. It is one of their low-cost cabinets, but it does feature a glass door which is great for showing off your collection! You’re able to store a range of different wines from top to bottom in this cabinet due to the different temperature throughout. Is this wine cabinet for me? If you’re looking to ‘show off’ your collection with a cabinet with a glass door and store a large quantity of bottles, then yes! You’re able to store a range of different wines from top to bottom in this cabinet due to the different temperature throughout. Temperature: 3 temperature zones – All of which can be set to a range of +5°C to +20°C. Value for money? This cabinet is one of the most expensive in the Liebherr range, but you won’t be disappointed with your purchase. The wine cabinet just oozes class with its stainless steel finish and glass door, it not only works perfectly but it’s visually stunning too. Is this wine cabinet for me? With the stunning stainless steel finish and glass door, this cabinet is perfect for people looking to store different types of wine within one cabinet, at the perfect temperature. With the 3 different temperature zones, you’re able to store red, white and champagne at the perfect temperature. Alternatively, you could use the different zones for short or long term storage, all within one cabinet! Value for money? This is one of Liebherr’s most cost effective cabinets. It features a glass door which is always an added bonus, so you’re able to store it anyway as it’s easy on the eye and will certainly impress your friends! Is this wine cabinet for me? If you’re looking to store over 200 bottles with an eye-catching glass door, then this is the cabinet for you. It is relatively low cost and with 6 storage shelves in the appliance, it’s perfect for long term storage. Want to know more about Liebherr Wine Cabinets? If you’re unsure on the type of wine cabinet that is right for you, don’t hesitate in contacting the friendly Wineware team! You’re able to do this by phone (01903 786148), email (info@wineware.co.uk) or via our social platforms, whether it’s our Facebook page or Twitter account. 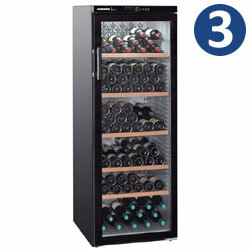 Click here for more information regarding our range of Liebherr Wine Cabinets. When you describe cabinets as ideal for long term storage, what do you determine as long term?